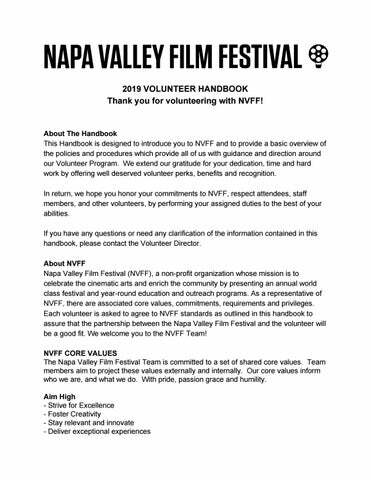 2019 VOLUNTEER HANDBOOK Thank you for volunteering with NVFF! Communicate and Collaborate to achieve best results - Respect the views of perspectives of each other and our constituents - Listen to other’s opinions and provide honest and constructive responses - Follow through on commitments in a timely manner - Trust and be supportive of each other - Reward and show appreciation for contributions that support our work Carry ourselves with gratitude, humility and quiet confidence - Act with Honesty and Integrity - Be proud of what we have done and who we are - Be thankful for the opportunity to do this work VOLUNTEERING WITH NVFF NVFF relies on the generosity and dedication of hundreds of volunteers. 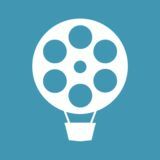 We seek volunteers who share a commitment to and passion for supporting independent film and the artists who make the movies. The NVFF Volunteer Corps are the amazing force behind producing a successful festival each and every year! VOLUNTEER LEVELS: COMMITMENTS & BENEFITS ● Shift Choice Volunteers, 12 Hours Plus​: Receive one volunteer voucher for every shift volunteered. Volunteer vouchers are redeemable for films on a space-available basis. Vouchers and credentials are non-transferable and must be used by the volunteer with his or her credential. ● Half-Fest Volunteers 25 Hours Plus​: Volunteers receive a Festival Credential, allowing the volunteer access to unlimited Festival screenings on a space available basis (when not volunteering, of course!) ● Full-Fest Volunteers & Managers 35 Hours Plus​: Volunteers receive a Festival Credential, allowing the volunteer access to unlimited Festival screenings on a space available basis (when not volunteering, of course! ), and grub stubs (If Volunteering during the Festival) that are good for a meal​ ​at participating locations. Full-Fest volunteers will also be a member of our new Volunteer Circle. ​Volunteer Circle​: NVFF perks throughout the year including NVFF special movie screenings and select events. age, disability, marital or veteran status, sexual orientation, or any other legally protected status. Smoking In response to state and local laws and building codes, smoking or vaping of any substance is NOT permitted. Please respect the laws and regulations. Solicitation Solicitation other than that from the NVFF organization, is NOT allowed when volunteering. Substance Abuse The possession, use or sale of illegal drugs is never acceptable in our organization’s environment. This can and will compromise your volunteer opportunities and we will not hesitate to call legal authorities. We do have alcohol being served at many of our venues; volunteers are ​NOT ​to engage in consumption while on shift. Volunteers need to​ ​remember that they are representing NVFF. Irresponsible actions occurring off-shift while wearing a volunteer badge are subject to review and may result in termination. Cell Phone Use We understand that you may need to accept or place a call or check emails. We ask that you refrain from doing so while on shift. If you need to do any of these, please keep it brief. Problem Solving Procedure When a group of people work and volunteer together, problems may arise. It is important to all of us that such problems are solved as quickly as possible. Occasionally, however, it may be necessary to investigate certain problems in greater detail. Our problem-solving procedure provides you with the opportunity to have a review of any problem, dispute, or misunderstanding that arise during the course of your volunteering. There is a chain of command we ask everyone to use: ● Notify your Manager, he or she will do their best to resolve the issue. If they are unable to resolve the issue, the Manager will notify the Village Coordinator. If it still isn’t resolved, the Village Coordinator will notify the NVFF Operations Manager who is assigned to the town. If you feel that the issue was not resolved, contact the Volunteer Director,​ ​and they will investigate the situation and attempt​ ​to resolve the issue as best possible. ● You may email the Volunteer Director at ​debbie@nvff.org​, at the end of your shift. ● If it cannot wait, call the Volunteer Director as soon as feasible. We are interested in the solution of any problem you, as a member of the team, may have. Dismissal Dismissal of a volunteer is a serious consideration. Before a volunteer is dismissed, attempts to reconcile the solution will be made with the Volunteer Director. Dismissal of a volunteer may take place if a volunteer is unreliable, irresponsible, disruptive, dishonest, demonstrates inappropriate behavior, or fails to adhere to the policies and procedures of the NVFF Volunteer Program. If you are dismissed as a volunteer, you will need to turn in your credential to the Volunteer Director. Ending Your Volunteer Service You may resign from your volunteer service with NVFF at any time. We request that you notify the Volunteer Director ASAP but please no later than the day before your first shift, ideally the sooner the better. Attending a Film or Panel or Culinary Demo as a Volunteer At NVFF, Volunteers are encouraged to attend screenings when they are ​NOT ​“on shift”. At almost all festival screenings, a set number of seats are “reserved” for off-shift volunteers. The number will vary based on the size of the venue. Pass Plus Gate Keeper will have numbered tickets available, first-come, first-served, beginning one hour prior to showtime. If Volunteers do not secure one of these tickets, they are welcome to wait in the Rush Line. ​Managers only ​are welcome to wait in the Festival pass line (Blue Line). Shift Choice Volunteers utilize vouchers they receive, one for each shift worked, to turn in for tickets. Half-Fest and Full-Fest Volunteers d ​ o not​ ​need vouchers and may try to attend as many screenings as they have “off-time” for. Please note that Panels (Film Industry and Culinary) work just like Movie Screenings.